Although LASIK (laser-assisted in situ keratomileusis) eye surgeries have been on the rise in Egypt, as well as worldwide, many misconceptions prevail. Ahram Online spoke with Dr. Amgad El-Adawy, a consultant eye surgeon at Cairo University and member of the American Society of Cataract and Refractive Surgery, in order to help our readers make informed decisions. Provided the required tests prove that the degree of imperfection is within range and that the cornea is not too thin, all three types of sight imperfection can be adjusted, whether it is farsightedness (seeing distant objects clearly), nearsightedness (focusing on close objects) or astigmatism (blurry vision due to corneal irregularities). “So as long as you are above 18 and not pregnant or breastfeeding, you can undergo the procedure safely after some pre-LASIK investigations,” says Dr. El-Adawy. Tests will ensure a patient has no hormonal fluctuations due to diabetes, for instance, or any existing problems like eye dryness, shingles or conical cornea. · Two weeks before sight assessment tests, contact lenses should be exchanged for eye glasses in order to avoid inaccurate measurements. · All tests recommended by the doctor should be taken. · 24 hours before the surgery, use of cosmetics or lotions on the face should be stopped. · After the procedure, the doctor might recommend analgesic to relieve any pain or itchiness that may occur. · Over the next few days, significant healing will occur, provided the patient avoid urges to rub the eyes despite blurry vision and tear secretion. · Follow up appointments should be scheduled within the day or two following the surgery, and throughout the next six months. · Until at least two weeks after surgery, avoid cosmetics and lotions around the eye. · Until at least a month after surgery, avoid putting anything in the eyes. · Until at least two months after surgery, avoid swimming or hot baths. 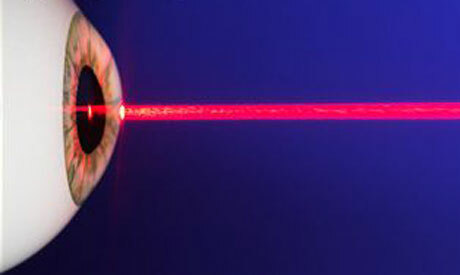 As long as one meets the criteria to qualify as a candidate for LASIK surgery, and doctors cover all necessary tests before the operation, the results are “almost guaranteed perfect,” Dr. El-Adawy says. Yet the fear and very real risk of damaging the eye is always present, though the doctor notes that this is often exaggerated. Nevertheless, on very rare occasions, a person may develop blurriness and discomfort after the operation due to severe dry eyes, or other symptoms might occur like a glare or double vision at night. In the case of over- or under-treatment, another laser session might be required and then eye glasses might be needed again.